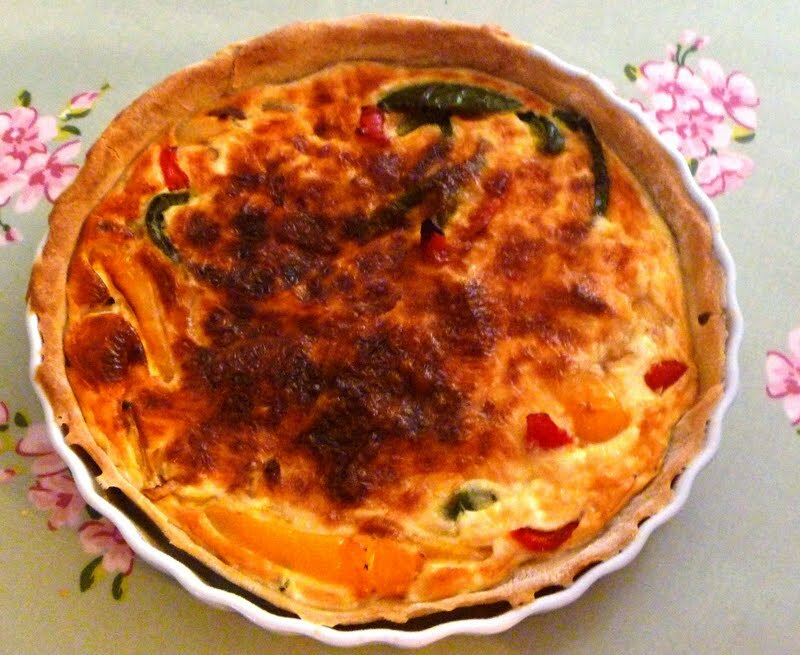 Home made Flan or Quiche is one of my favourite things to eat. 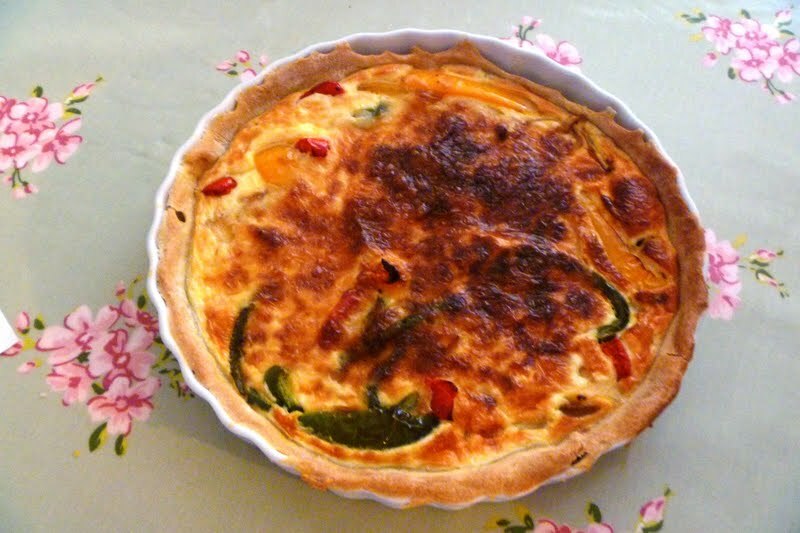 I love sending time cooking quiche and in my opinion, shop bought versions just do not live up to the taste of home made. Unfortunately, my family don't appear to feel the same way. Hubby is not a fan and neither are the kids. I do cook a quiche and freeze it sometimes, but it is just not the same as eating when it's freshly cooked. So whenever I am asked by friends to bring something for a shared lunch, I jump at the chance to make a flan and actually have it eaten. We had our summer meet up for our tutor group yesterday and I made this flan to bring along. 75% of it got eaten, so I am guessing that people enjoyed it! The recipe is from the Dairy book of Home Cookery, I added some cheese to the original recipe to give it a bit more flavour. Mixed pepper flan is a great summer dish and tastes so delicious. Using red, green and yellow peppers creates a colourful appearance which is very appealing. The flan is ideal as a meal served with salad and new potatoes or warm or cold as part of a buffet or shared lunch. Flan or Quiche seems to be one of those dishes that really divides people, I would guess because of its texture and consistency. So are you a Quiche lover or loather? Add the butter and rub into the flour until the mixture resembles fine breadcrumbs. Add the water a tbsp at a time and mix to a a dough with a round edged knife. Add more water or flour as required to achieve a smooth consistency. Roll out the pastry on a floured work surface to the desired size and shape of the dish being used and line the dish with pastry. Bake blind at 200 degrees, gas mark 6 for 15 minutes. 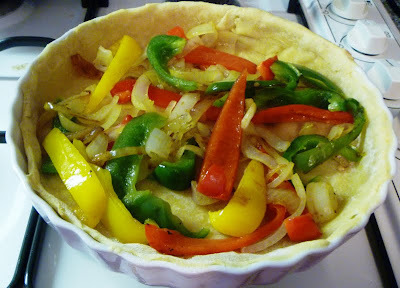 Meanwhile, melt the butter into a pan and fry the onion, peppers and garlic until soft but not brown. Beat together the eggs, cream and milk in a separate bowl. Add the cheese, stir and season to taste. Once the pastry has cooked for 15 minutes, remove from the oven and spoon the cooked vegetables into the dish, covering evenly. Reduce the oven temperature to 180 degrees, gas mark 4 and cook for 30 minutes, or until set.